In 12-inch skillet or sauté pan, cook bacon over medium heat about 5 minutes or until crisp. Remove bacon from skillet; place on paper towels to drain. Set aside. To drippings in skillet, add potatoes, onions and bell peppers; cook about 20 minutes, stirring occasionally, until potatoes are tender and onions and peppers have browned. Sprinkle potato mixture with salt and pepper. Return bacon to skillet. Stir in thyme and parsley. To fry eggs, heat 10-inch skillet or sauté pan over medium heat. Add oil to skillet. Crack eggs into skillet; cover with lid or plate. Cook 3 to 4 minutes or until egg yolks are firm. Add fried eggs to top of hash. If you have leftover roasted or baked potatoes, this is a perfect way to use them. Sauté the onions and bell peppers, and then add the potatoes at the end to heat thoroughly. 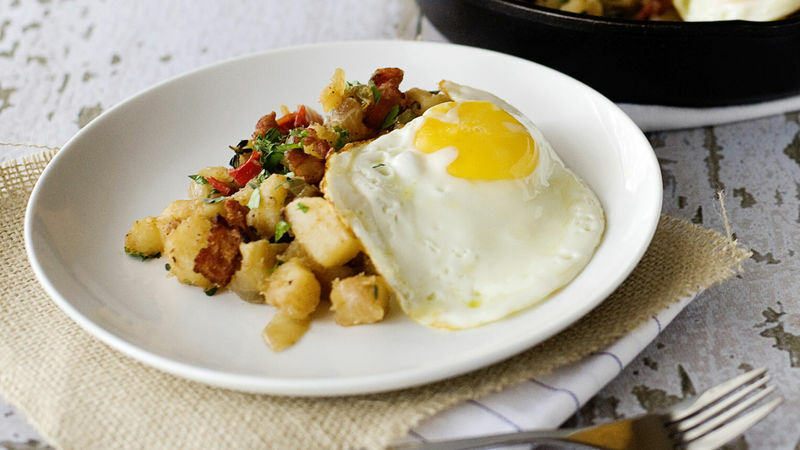 You can use whatever you have in your fridge to make this hash. Ham, mushrooms, tomatoes, spinach—anything would be great in this recipe.